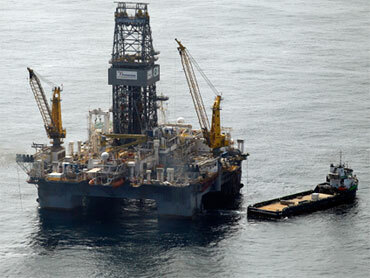 The Obama administration announced Monday it is requiring environmental reviews for all new deepwater oil drilling. That means an end, at least for now, to the kind of exemptions that allowed BP to drill its blown-out well in the Gulf with little scrutiny. The announcement came in response to a report by the White House Council on Environmental Quality, which found BP got environmental exemptions based on decades-old data. The Interior Department said the ban on so-called "categorical exclusions" for deepwater drilling would be in place pending full review of how such exemptions are granted. For now, new deepwater drilling is under a temporary moratorium in the Gulf. Once that's lifted, though, Interior's new policy is likely to make it much more time-consuming for oil companies to move forward with new deepwater projects, since environmental assessments will be required along the way. BP's ability to get environmental exemptions from the Minerals Management Service led to some of the harshest criticism of the now-defunct agency in the wake of the April 20 explosion that killed 11 workers and led to the worst oil spill in U.S. history. Some 206 million gallons spilled into the Gulf before BP stopped the leaking. The report also finds other problems with how the Minerals Management Service applied environmental laws in reviewing the BP project. It notes, for example, that in assessing the likelihood of a major spill, MMS did not consider the example of the disastrous 1979 Ixtoc spill in the Gulf  simply because the spill was not in U.S. waters. MMS' successor agency, the Bureau of Ocean Energy Management, Enforcement and Regulation, is agreeing to recommendations to try to improve drilling regulation in future.